Located in Manitou Springs, Colorado, the Broadmoor Pikes Peak Cog Railway is known as the highest cog railway in the world. 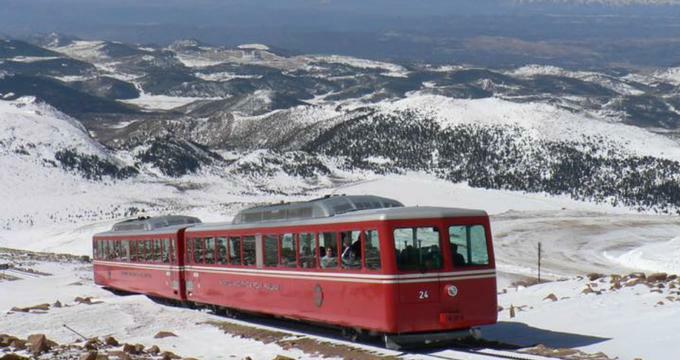 The Broadmoor Pikes Peak Cog Railway ascends around the popular Colorado mountain range, Pike’s Peak. Renowned inventor, Zalmon Simmons, traveled to the Pikes Peak Region in the late 1880’s. During this trip, the Simmons Beautyrest Mattress Company owner traveled to the top of Pikes Peak on the back of a mule. Although the trip was rigorous and took two days, traveling by mule was the only efficient way to make it to the top of the Peak. Simmons believed everyone should be able to reach the top of Pikes Peak in an efficient and quick manner. During one a mineral bath in Manitou Springs, a hotel owner suggested railroad to be built to take people to the top of the peak. Simmons agreed to this idea, and began funding the venture. The Manitou and Pikes Peak Railway Company was founded in 1889. That same year, railroad construction also began. One year later, three engines from Philadelphia, Pennsylvania were brought to the railroad. Eventually, the original three engines used the Vauclain Compound system to operate, and three new engines were brought to the engine. Currently, only one of the original six engines is operational. In the summer of 1891, the Manitou and Pikes Peak Railway Company celebrated success with the first passenger train that made it to the top of Pikes Peak. In 1925, Spencer Penrose, who also owned and operated the Broadmoor Hotel, purchased the Railway. With Penrose’s direction, the Railway introduced locomotives that were powered by gasoline and diesel, as well as compact railcars that were to be used during the off-season. In 1938, engine No. 7 was created and had the ability to carry 23 passengers. Many people believe that the first rack railcar in the world was this No. 7 engine. In 1939, the General Electric Company produced what is thought to be the first cog locomotive that is diesel-electric. This locomotive is known as No. 8. From 1940 to 1965, “Streamliner” locomotives, such as Nos. 8, 9, and 10 prevailed. During the early 1960s, the modern age of the Railway began with tourism booming. Most of the popular railcars during this age came from Switzerland. Eventually, a Swiss engineer named Martin Frick was hired. With the help of Frick, the Manitou & Pikes Peak Railway became one of the most popular and innovative railways in the modern age. In the most recent years, Mr. Frick has served as an advisor to the Manitou & Pikes Peak Railway when they do business transactions with Switzerland and Germany. The main attraction at the Broadmoor Pikes Peak Cog Railway is the railroad ride. Visitors take around a three hour journey across approximately 8.9 miles of railroad tracks. When visitors first hop aboard the train, they will travel alongside the Ruxton Creek. Then, the train travels through a dense spruce area full of Engelmann and Ponderosa pine trees. On either side of the train, visitors will be able to see fields of boulders. The next stop on the train ride is Minnehaha Falls, which can be seen on the up bound and down bound route. From Minnehaha Falls, the train loops through “Hell’s Gate”, which is an opening in the mountains, and Deer Park. The first time guests will have a clear look of Pikes Peak is when the train follows along the Four Mile Siding route. After spending the next three miles ascending the mountain, visitors are allowed to explore and experience the top of Pikes Peak for 30 to 40 minutes. Although this seems like a short amount of time, most people will get a headache or feel nauseous after hanging out at the top of the Peak for 30 minutes. This is completely normal and due to high altitude. Guests have a few dining options. While they can’t bring external food on their train ride, they are welcome to purchase snacks from the Cog Wheel Market and take them on the ride. Also, groups of 15 or more can reserve lunch that can be taken on the train or enjoyed after the trip. Lunch options consist of a ham sandwich, turkey sandwich, or salad, alongside a cookie, bag of chips, and bottle of water. In addition to the Cog Wheel Market and lunch program, visitors are welcome to purchase something to eat from the Café located in the Summit House, which is at the top of Pikes Peak. It’s important to note that the line for the Café is usually long. If you want to avoid spending majority of your time at the top of the Peak in a Café, purchase something before you embark on your train ride.